This article is part one in a three-part guide to biking the Great Allegheny Passage. 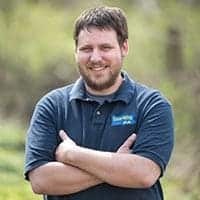 Check out our other articles in the series, Part Two: Connellsville to Confluence and Part Three: Confluence to Cumberland. And don’t miss my top tips for those biking the GAP. 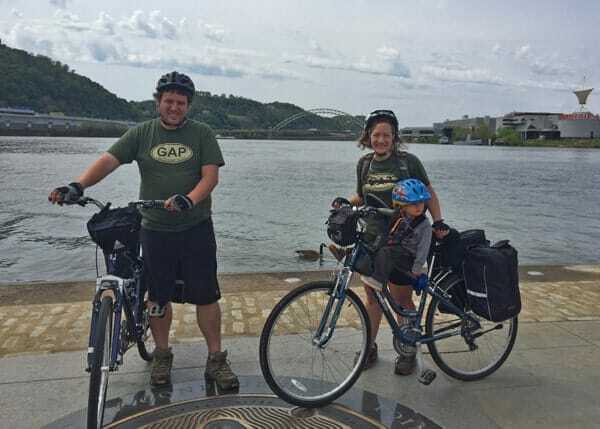 The Great Allegheny Passage (GAP) runs 150 miles from the Forks of the Ohio (also known as The Point) in Point State Park to Cumberland, Maryland. The decision of where to start your trip is a contested topic, and there are pros and cons for starting at either end of the trail. However, since most travelers on the GAP start their trip in Pittsburgh, I will be writing this guide in that direction. Should you be biking from Cumberland, Maryland, keep in mind that you will be biking in the opposite direction of this article. The first third of the trail, from Pittsburgh to Connellsville, is not the most beautiful part of the trip. However, it is the most varied, with impressive cityscapes and plenty of dining options giving way to picturesque small towns and beautiful scenery. My wife, son, and I at the starting/ending point of the GAP in Pittsburgh. The portion of the trail that’s covered in this article represents two overnights on my six-day trip. My first night was in West Newton, 35 miles from the start of the GAP and my second night was 25 miles further in Connellsville, where this first guide will end. When planning your trip on the Great Allegheny Passage, it’s worth noting that there is little between West Newton and Connellsville. Your choices are to cover the ground over two days, or travel 60 miles from downtown Pittsburgh to Connellsville. 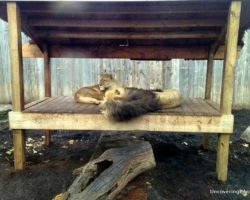 Of course, if you’re camping along the trail, there are several camping options between the trail towns that provide convenient places to stop. If you’re looking for somewhere to stay while in Pittsburgh, I’d recommend the Grand Wyndham. 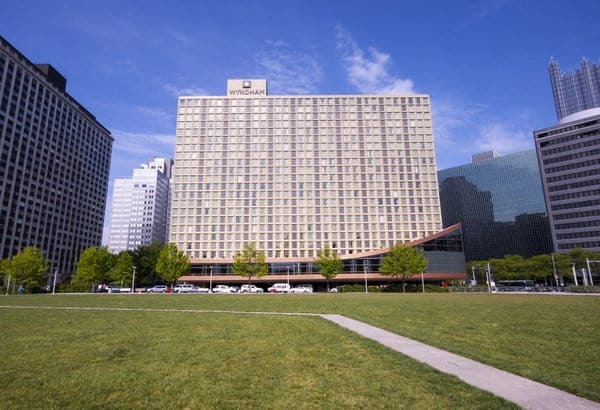 This is the closest hotel to the Point, located just across the street from Point State Park. This hotel offers trail riders quick access to the start/end of the trail without having to ride through the city, and I quite enjoyed my stay at this hotel and the beautiful views from my room. Click here to check pricing and availability on Booking.com [Affiliate link]. You can also read reviews of this hotel on TripAdvisor [Affiliate Link]. The Wyndham Grand is located just across the street from Point State Park. There are plenty of restaurants in the area surrounding Point State Park, though most of them require navigating a few city blocks. 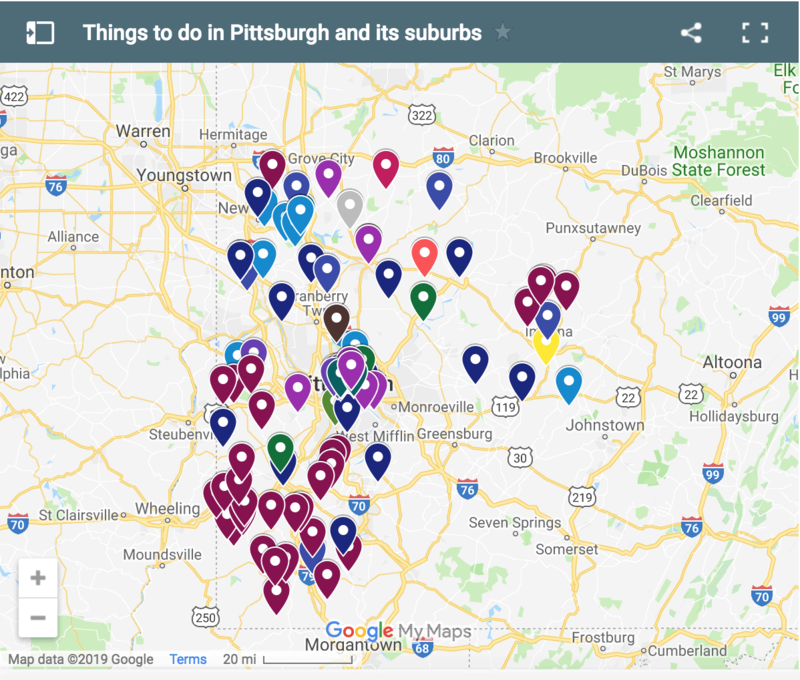 A few places that I have eaten at and enjoyed in the general area include Primanti’s, The Original Oyster House in Market Square, and V3 Pizza on Fifth Avenue. 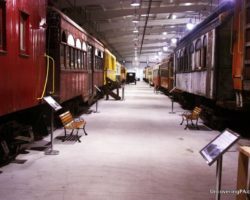 If you have time to do some sightseeing in Pittsburgh, make sure to check out all the great things to do in Pittsburgh that have been featured on this site. Finding the starting (or ending) point of the Great Allegheny Passage in Point State Park is quite easy. Simply keep going until you have to either stop or ride into the river. 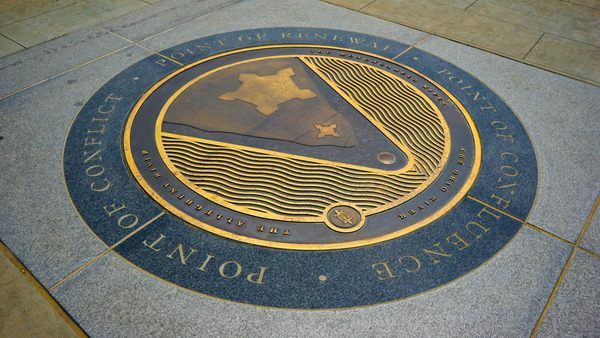 While there is no signage for the Great Allegheny Passage here, this medallion in the ground, which marks the Forks of the Ohio River, marks the starting point of the trail. Facing the fountain and city, you’ll be looking at some of the most contested land in early America. Behind you is the Ohio River, the Allegheny River is to your left, and the Monongahela River is to your right. You’ll be following the Monongahela for the first 18 miles of the trail. The British army began construction on Fort Prince George on this site in 1754. Before completing the fort, they abandoned it, and the French built Fort Duquesne in the same year. This land was critical to shipping goods to the Mississippi River and the Gulf of Mexico, and ownership of it was one of the chief issues that led to the French and Indian War. Eventually, in 1758, the British took over the land for good and built Fort Pitt. 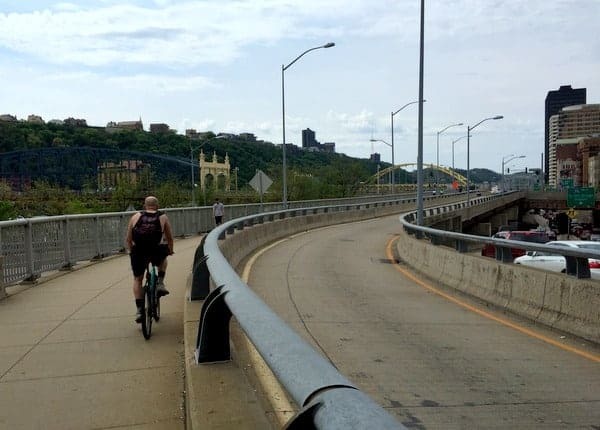 If you have some time before or after your bike ride, take some time to explore the outsides of both Fort Duquesne and Fort Pitt, which have been placed in the ground. 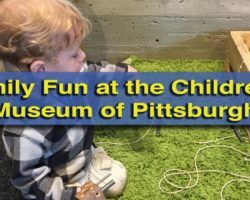 The park’s Fort Pitt Museum features excellent displays that talk about the founding and history of early Pittsburgh, and the Fort Pitt Blockhouse in the park is the oldest, still-standing European building west of the Allegheny Mountains. 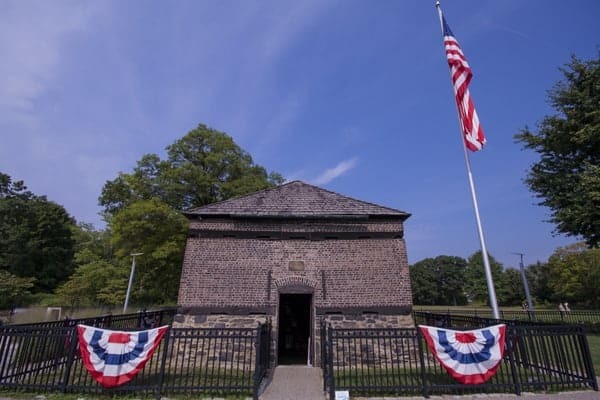 The Fort Pitt Blockhouse in Point State Park is the oldest structure in Pittsburgh. The hardest part of the Great Allegheny Passage is figuring out how to navigate the Pittsburgh streets to get from The Point to the start of the designated bike trail. It is hoped that in the coming years, a dedicated bike path will be constructed for trail riders, but until then, a short street ride is necessary to connect to the trail. The map below illustrates the best way to get between The Point and the Three Rivers Heritage Trail, which runs congruously with the GAP in the Pittsburgh area. You can pick up the bike trail near the Smithfield Street Bridge. From Point State Park, ride down Boulevard of the Allies until you reach the trail near Grant Street and First Avenue. If you are going to Point State Park, you can take the trail until it ends, and then ride down Fort Pitt Boulevard to The Point. As soon as you reach the bike trail, you’ll notice Golden Triangle Bikes underneath the Liberty Bridge. They were nice enough to provide me with some of my gear for my trip, and I’d recommend contacting them if you are looking for gear rental, trip planning assistance, or shuttles. 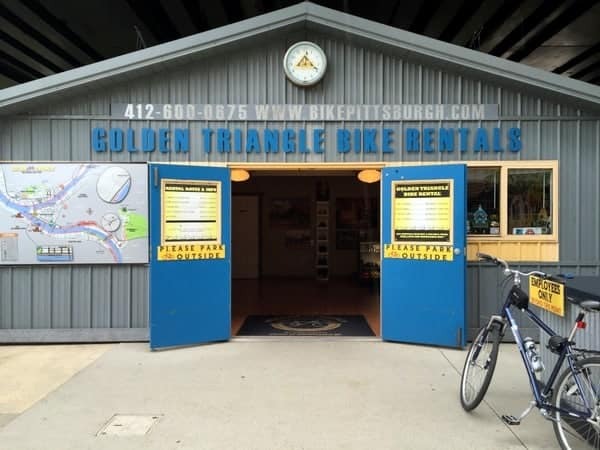 They also offer guided bike tours of Pittsburgh if you want to learn more about the city before or after your trip on the GAP. Golden Triangle Bike was my partner on this trip and offers many great services for bikers of the GAP. As you bike out of Pittsburgh, it’s fascinating to think about what the city looked like a century before. Steel mills lined the river for as far as the eye can see, which is much different than the current landscape of office buildings and condos. However, that doesn’t mean that there isn’t still evidence of Pittsburgh’s steel industry. The first bridge crossing of the trip is over the Hot Metal Bridge. This bridge is so called because it was used by trains to transport molten iron from the iron furnaces to the steel mills on the opposite side of the river. Further down the GAP at Homestead, there is another Hot Metal Bridge. Take a few minutes to stop at the Homestead Strike site and read about this tragic moment in American history. Across the river from the strike site is Carrie Furnace. This is the last remaining piece of the Homestead Steel Works and is open for tours seasonally. The Mon Valley Works, the last working steel mill in Pittsburgh, as seen from the GAP. 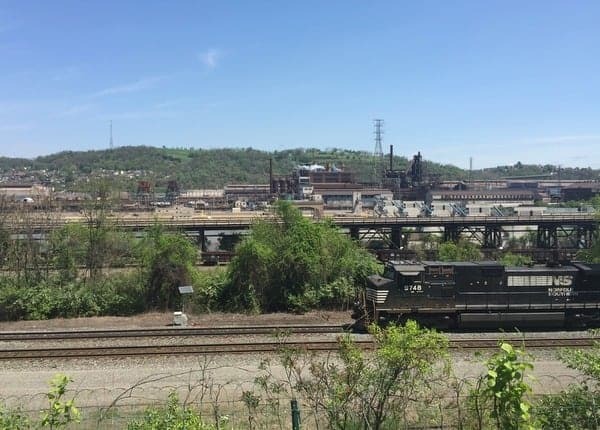 A few miles further down the GAP, you can also see the Mon Valley Works, the last remaining steel mill in the Pittsburgh area, across the Monongahela River from the trail. In that same area, but on the trail’s side of the river, you won’t want to miss the bald eagle nest, which can be found near mile marker 142. And, if you visit when the park is open, it can be fun to watch the rollercoasters of Kennywood passing overhead. For the eight miles from Homestead to McKeesport, much of the trail passes through an industrial corridor. Trains run on tracks that are directly next to the GAP and, in several places, large warehouses sit alongside the trail as well. Truth be told, this is probably the least scenic portion of the entire trail. 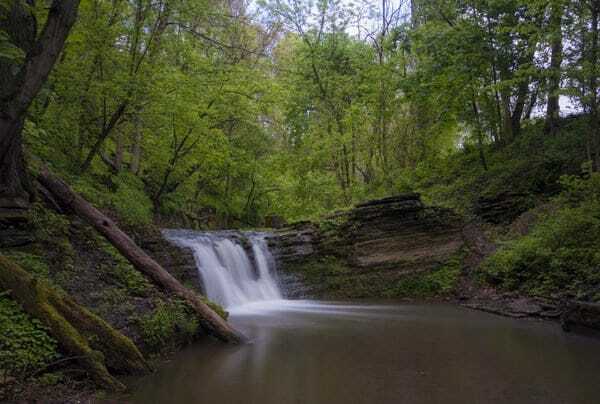 However, make sure to enjoy the fact that the trail is paved, as the majority of the trail is crushed limestone which is a bit more difficult to ride on, especially if it’s wet. The Great Allegheny Passage in Pittsburgh is very industrial with roadways, train tracks, and warehouses lining much of the trail. While downtown Pittsburgh is the most challenging part of the trail, passing through McKeesport isn’t much better. The Great Allegheny Passage travels along several little used roadways as it loops around the outskirts of the city. There are multiple turns in the trail here that you’ll need to be careful to not miss, but they are well marked and shouldn’t prove too much of a challenge. In McKeesport, you’ll leave the Monongahela River behind and pick up the Youghiogheny River, which you’ll follow for the next 70 miles of the trail. Leaving McKeesport, you’ll have to walk your bike along a narrow sidewalk on the 15th Street Bridge over the Youghiogheny. Once across the bridge, it’s a short ride on a wide, little-trafficked road back to the trail. There are several significant hills leaving McKeesport, but soon enough, you’re on the Great Allegheny Trail proper. From this point on, the trail is a relatively flat ride and gets more and more scenic the further you get from McKeesport. 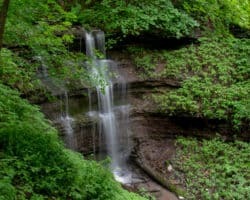 Between McKeesport and West Newton (a distance of 18 miles), the trail passes through several interesting areas, including Dead Man’s Hollow (which has several miles of hiking trails) and The Red Waterfall. 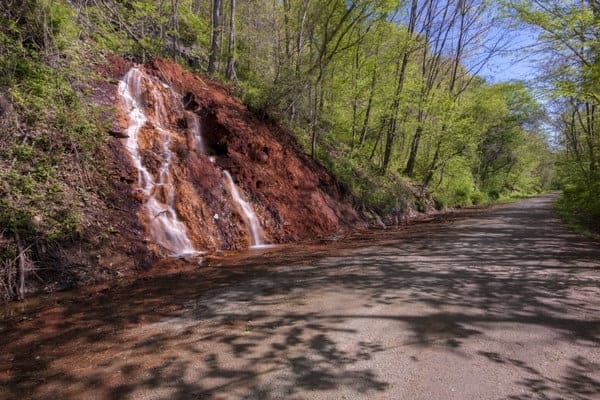 The rocks of this waterfall here have been turned red by water runoff from nearby mines. While it might look beautiful, this is an example of the negative environmental effects of the area’s industrial past. The Red Waterfall along the GAP between McKeesport and West Newton. 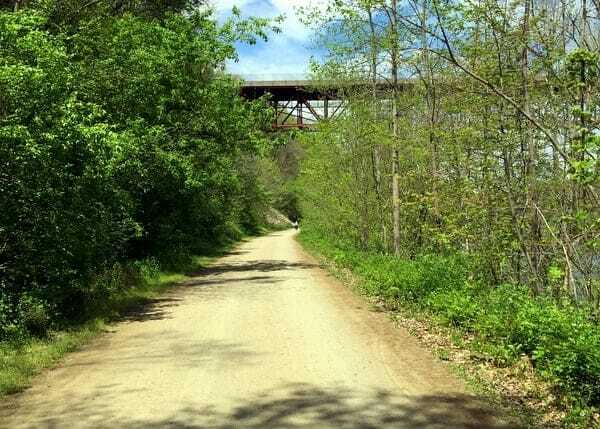 As you travel the trail between McKeesport and Connellsville, the trail passes through several small towns. If you look closely, you’ll notice that many of the homes here are of similar construction. Communities like Buena Vista, Van Meter, and Whitsett are examples of company towns where homes were built for workers in the nearby factories and coal mines. Whether you opt to overnight in West Newton or not, this trail town is worth a short stop as it offers the most dining options between McKeesport and Connellsville. 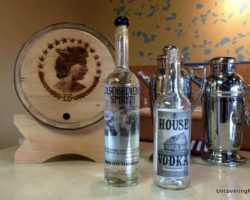 The Trailside is a restaurant and bar that is quickly becoming famous along the trail. The community’s bike shop is in the restaurant’s basement should you need any bike maintenance or supplies. If you are visiting on a Saturday or on a Wednesday evening, another great stop is Bloom Brewery on the opposite side of the river. 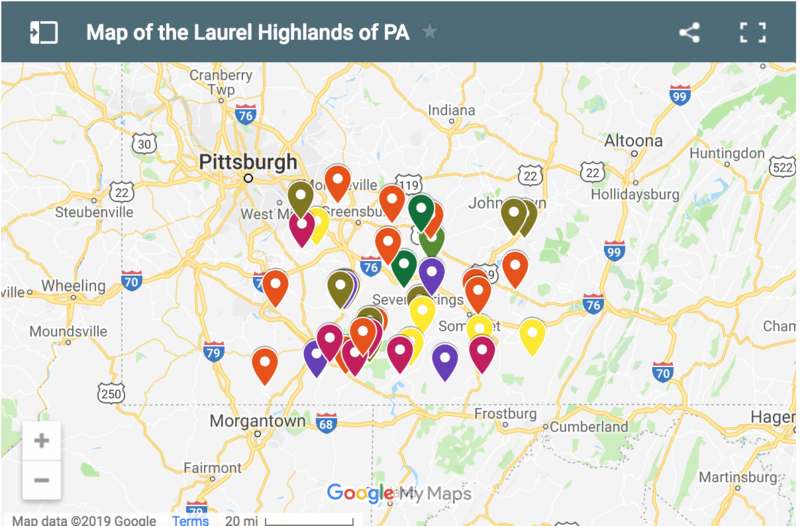 This brewery offers craft beer growler fills and has some of the most delicious beer you’ll find in southwestern Pennsylvania. Bright Morning Bed and Breakfast is located along the trail in West Newton, PA. If you’re staying overnight in West Newton, Bright Morning Bed and Breakfast is an excellent choice. I was invited to stay here during my visit and enjoyed my comfortable room and a delicious breakfast. They are located right along the trail and are close to restaurants, the restored train station (which now serves as a visitor center), and the Youghiogheny River (which offers great fishing). You can read reviews of this B&B on TripAdvisor [Affiliate Link]. From West Newton, it’s 25 miles to Connellsville, the next trail town along the Great Allegheny Passage. The undulating hillsides between these two towns provide little rest for the weary biker, but the trail’s beauty makes up for it. This part of the trail will be your first taste of the GAP’s remoteness, and there are few options for dining or water anywhere near the trail. However, this remoteness adds to the beauty of the trail. Shortly after leaving West Newton, you’ll pass through Cedar Creek Park. This 450-acre local park is popular with locals, especially on weekends, and offers both drinking water and camping for bikers. As the GAP passes under Interstate 70, you’ll notice a shift in the atmosphere. North of the interstate, the trail passes through the Pittsburgh Suburbs. However, south of the interstate, the trail is much more forested and rural and leaves the suburbs quickly behind. Approaching the Interstate 70 bridge on the GAP. 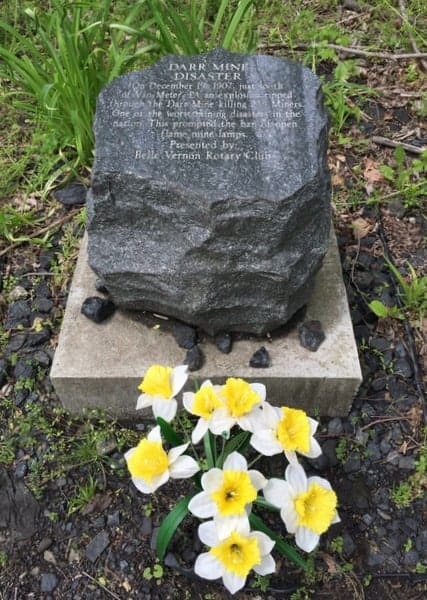 Just before and just after the interstate, keep your eyes out for two mining memorials: Port Royal Number 2 Mine Disaster and the Darr Mine Disaster. These two memorials commemorate the lives lost in two horrible coal mine accidents from the early 20th century. Unfortunately, accidents like these were all too common, and these accidents led to changes that made mining safer today. A memorial along the trail to those killed in the 1907 Darr Mine Disaster in Van Meter. Also of note as you get closer to Connellsville are the remains of coke ovens in the hillside. While there are several signs pointing these out, there are dozens hidden in the hillside opposite the river. This is another reminder of the massive amount of industry that lined the banks of the river 100 years ago, and how nature is reclaiming the land today. Connellsville is the largest community on the Great Allegheny Passage between McKeesport and Frostburg, Maryland. Here, trail riders can find all the amenities necessary to make for a great stay. Connellsville is also home to the only Amtrak stop between Pittsburgh and Cumberland, Maryland, making this an ideal place to start or end a partial ride of the trail. I was invited to spend the night at Connellsville Bed and Breakfast, which sits above a wine store a block off of the GAP. While it doesn’t appear to be a traditional B&B from the exterior, this is a great place to stay and offers comfortable rooms and a filling breakfast. Read other guest reviews of this B&B on TripAdvisor [Affiliate Link]. 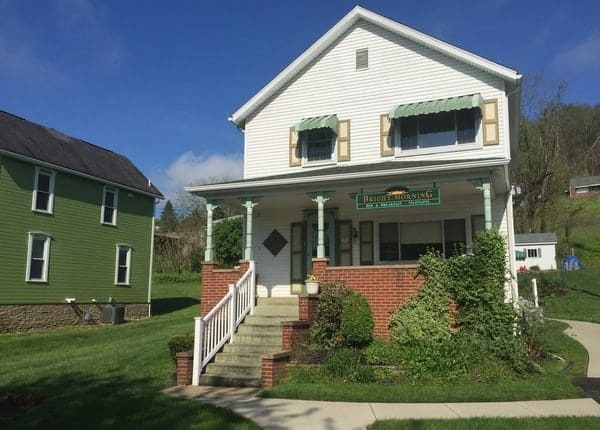 The Connellsville Bed and Breakfast is a great place to stay in Connellsville. 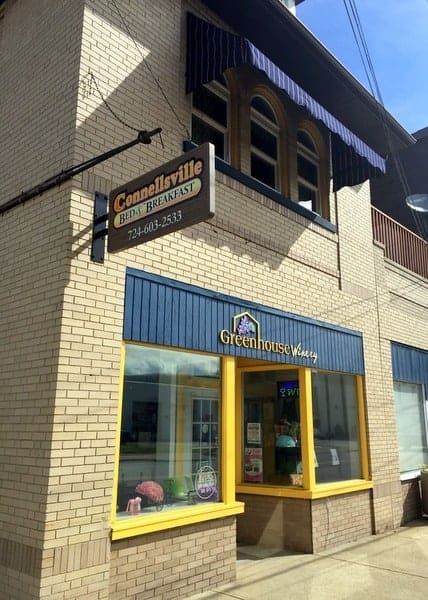 Most dining options in Connellsville are on the opposite side of the Youghiogheny River from the trail (as is the train station). I enjoyed a great Mexican dinner at El Canelo 3, but there are other nice places to eat in town should you not want Mexican food. Those with a sweet tooth won’t want to miss New Haven Trailside Treats, an frozen yogurt shop next to the trail. 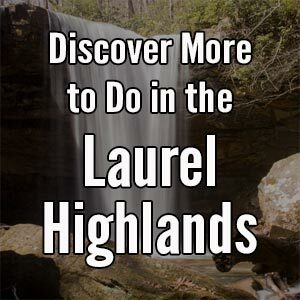 If you arrive in Connellsville and are looking for something to do, East Park Falls and Robinson Falls are both located a short walk or bike ride from the trail. 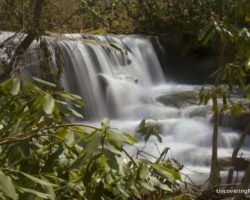 Upper East Park Falls is one of three waterfalls within a short walking/biking distance of the GAP in Connellsville. Once you reach Connellsville, you are over a third of the way done with the Great Allegheny Passage, having completed 62 of the trail’s 150 miles. Whether you’ve completed this distance in one day or two, Connellsville is a great place to relax for a bit before continuing on to your next destination. This ends part one of my guide to the Great Allegheny Passage. Part two covers Connellsville to Confluence, the shortest, but most beautiful portion of the GAP. Part Three covers Confluence to Cumberland, Maryland, and the end of the Great Allegheny Passage. Also take some time to read all of my top tips for a successful ride on the Great Allegheny Passage. Note: As mentioned in the article, the lodging options listed were gracious enough to offer me complimentary stays during my time riding the GAP. I also received complimentary assistance from Golden Triangle Bike. Check out Lucky Dog Cafe when you get to Confluence! Thanks for the info!! Live in Connellsville and am hoping to bike to Pittsburgh sometime!! Definitely a great trip. Can do it in very pleasant two-day ride and then take the train back home (or take the train to Pittsburgh and then ride home). Nice write-up. The GAP is a magnificent trail! It doesn’t need any greater description, but I found the multicolored arch over the trail at the northwestern edge of Connellsville worth noting. Thanks for UNCOVERING what we in Connellsville have been trying to share with everyone for years now. The Inn at Lenora’s is a great place to stay while biking The Gap. 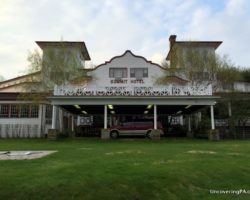 It has a wonderful restaurant.It is located between West Newton and Connellsville near mile marker 101. Where can I access the Darr mine trail? 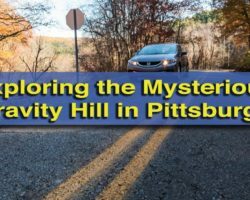 Just how ambitious is Pittsburgh to Connellsville in day one? Thanks! It depends on who experienced you are. If you’ve done a lot of long distance biking, it’s doable. If you haven’t, 77 miles is A LOT for someone inexperienced. Probably possible either way, but you might be pretty sore at the end.